What is the definition of the term "card marking" in the world of poker? 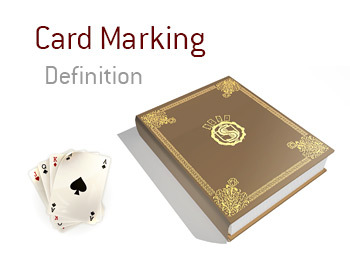 What is meant by the term "card marking"? In poker, "card marking" is the illegal practice of altering cards so that a cheater knows what their opponent is holding. Example - there is a high stakes home game taking place that involves a professional poker player and two rich "whales". In an attempt to gain an edge over his opponent, the professional poker player attempts to bend the corners of all of the Aces and Kings in the deck without anyone else noticing. If the player is successful, he would know, for instance, that an opponent of his would be holding, at the very least, A-K if his opponent had two marked cards in his hand. Most dealers are trained to spot marked cards, but the innocent players in the game must also stay vigilant and keep a watchful eye in order to help identify marked cards. Bending a corner or making a nick on a card is a very simple way of marking cards. As you can imagine, cheaters have attempted to utilize more sophisticated methods in order to try and swindle other players, including the use of invisible ink or luminous marked cards. A player who is hosting a home game and is providing the cards will obviously have much more opportunity to mark cards compared to somebody who is playing in a reputable casino. If you are found guilty of marking cards by a casino, you will almost certainly be banned for life.